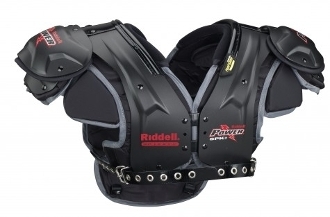 The next generation of Riddell shoulder pad technology is here with the Riddell Power SPK+ FB/LB shoulder pad. Replacing the original SPK, the new "plus" version features Riddell RipKord Technology along with the high level STAC system that provides superior shoulder protection and maximum flexibility. Removable clavicle pads and channels allow you to customize the pad to your liking and protection needs. An air management liner system allows dispersion of shock and the flow of air throughout the pad. All of the great features of the pad are topped off with the standard attached SPK back plate, making the Riddell Power SPK+ Adult Football Shoulder Pads - FB/LB a GREAT value and must have!